Formidable newcomers enter health care, while established players plan their investments better. A bust of Dr Bidhan Chandra Roy adorns the lobby of the infrastructure and construction giant Jaypee Group's upcoming hospital in Noida. Dr Roy was a ex-chief minister of West Bengal, as well as a physician of legendary repute, who treated Mahatma Gandhi. Manoj Gaur, Jaypee Group's Executive Chairman and CEO, maintains the hospital will be a tribute to Dr Roy. 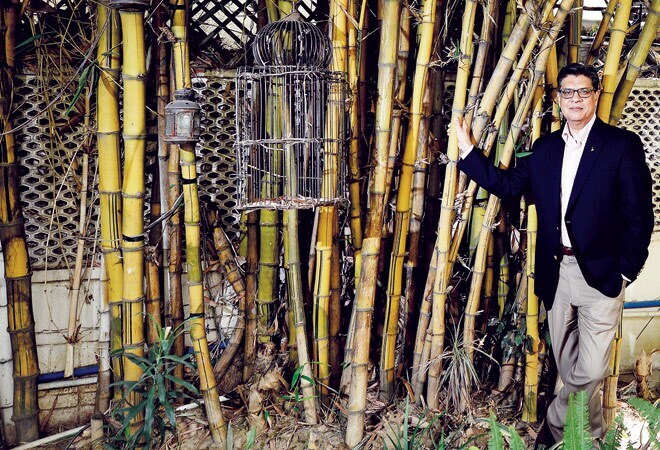 "We can't forget what a great medical practitioner he was," he says. The hospital is also the Jaypee Group's first foray into health care. Located in the heart of a 1,200-acre integrated township called Wish Town the group is building in Noida, it will start with 500 beds, increasing to 1,200 in a few years and offer all kinds of super specialties. "There are many marquee hospitals in Delhi, but none in Noida," says Gaur, explaining his decision. With an investment of Rs 2,000 crore, Jaypee Hospitals - as the hospital arm is called - is also setting up three more facilities in the nearby towns of Bulandshahr, Agra and Sahibabad. In what will be essentially a hub-and-spoke model, Jaypee plans another 40 health centres too, with 10 to 50 beds each, all of which will plug into the mother hospital at Noida. 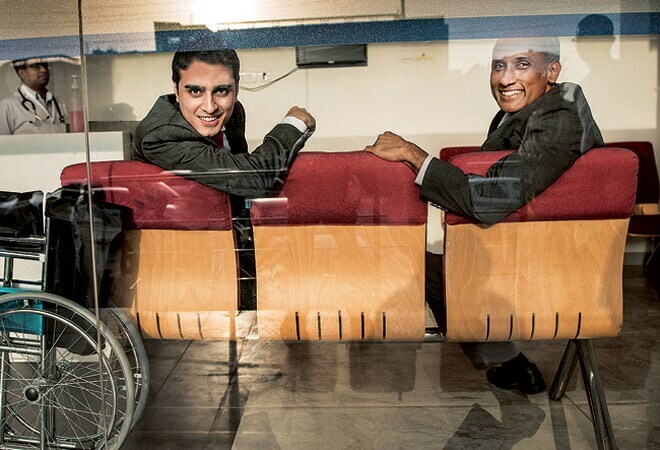 The Jaypee initiative is part of a recent rush into private health care, with at least three formidable newcomers entering the sector. The second is IT services major HCL Corporation, which has started HCL Healthcare run by Shikhar Malhotra, HCL founder Shiv Nadar's son-in-law. HCL Healthcare is setting up a chain of 250 clinics, the first two of which have already opened in Gurgaon and Noida, under a subsidiary, HCL Avitas. If medical clinic chains are rare enough in India-most of the 100,000-odd clinics in the country are standalone units - state-of-the-art ones of the sort HCL Avitas is building are almost unheard of. "We want a network of multi-specialty clinics," says Harish Natarajan, CEO, HCL Avitas. To build the network, HCL has partnered with global health-care leader Johns Hopkins - the clinics will all be connected by video and have a common electronic health record database, so a patient's history can be accessed at any of the clinics as well as by the patient himself over his phone. 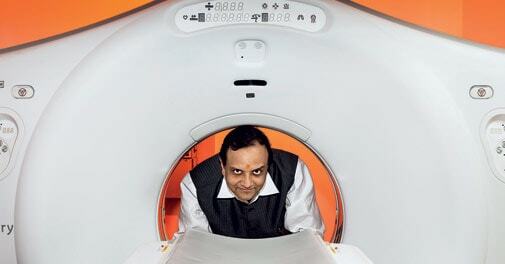 Malhotra's ambition is to touch 20 million patients by 2020. The third entrant is the Burman family, promoters of the Dabur Group, who entered into a 65:35 joint venture with a British agency, HealthCare at Home, in September 2012 to offer precisely that in India - hospital-level facilities at patients' homes. "Often when a patient comes back home from hospital, his/her condition drops," says Vivek Srivastava, CEO, HealthCare at Home. "Our objective is to provide the same level of care as the hospital did inside the house." HealthCare at Home can set up an intensive care unit (ICU) in the patient's house if required, as well as provide services which usually need hospitalisation, such as dialysis or chemotherapy. Srivastava maintains it is actually economical for patients to use his company's services. "Chemotherapy is 10 to 15 per cent cheaper than in hospitals, ICU care as much as 50 per cent cheaper," he says. The company has so far treated over 1,000 patients in Delhi and parts of Haryana, Himachal Pradesh and Punjab. Others, such as Portea Medical are pioneers in this space, too. Simultaneously, established players in the sector such as the Max Healthcare, the Fortis Group and the Apollo Group are also undergoing changes. 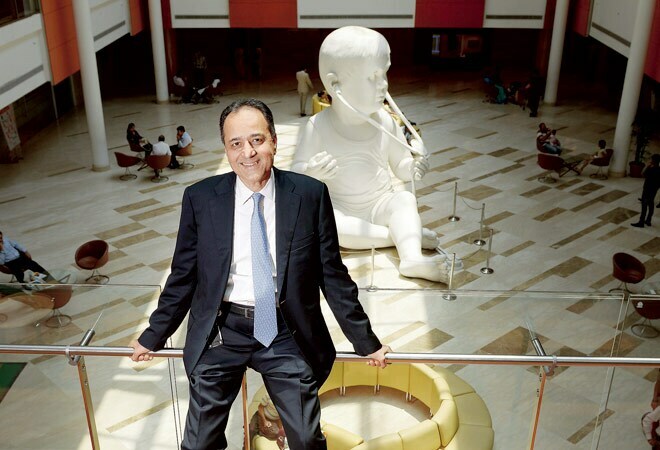 Analjit Singh, promoter of Max Healthcare, recently stepped down from the company's board to make Rahul Khosla its Chairman. Khosla is also the managing director of the group. Singh's intent in choosing Khosla, a banker of three decades who joined Max Healthcare just three years ago, was to further 'professionalise' the company. 'The cost of the technology we are installing today can be divided over the 100 clinics we will set up in coming years,' says Shikhar Malhotra, HCL Healthcare (left) with Harish Natarajan, HCL AVITAS. Among the new areas Khosla is focusing on is telemedicine. The infrastructure is already in place in parts of Haryana and Punjab. "We have been in the forefront of deploying technology, starting with electronic health records and more recently enabling outreach where our doctors are able to conduct clinics up to 300 km away, especially in rural areas using telemedicine and imaging technologies," he says. Another key focus is super specialities. "In addition to traditional specialties like cardiology, we have focused on developing tertiary and quaternary specialties such as oncology, neurosciences, bariatrics, high end orthopaedics, nephrology and gastroenterology." The Fortis Group too has ventured into a variant of telemedicine - it has been setting up eICUs. Teams of nurses go to small towns and start these units, which are connected to the mother hospitals in a manner that patients can be hospitalised and treated there, with doctors never having to physically visit them. "We started with 10 beds two years back, and now have 150 beds," says Aditya Vij, CEO, Fortis. The company's mainstay hospital business is also expanding, with a target of setting up 500 new beds every year, either at existing facilities or at new ones it will build. Among specialities, it is setting up an oncology centre at its Mohali hospital, and a mother-and-child focused one at its Ludhiana unit, called La Femme. 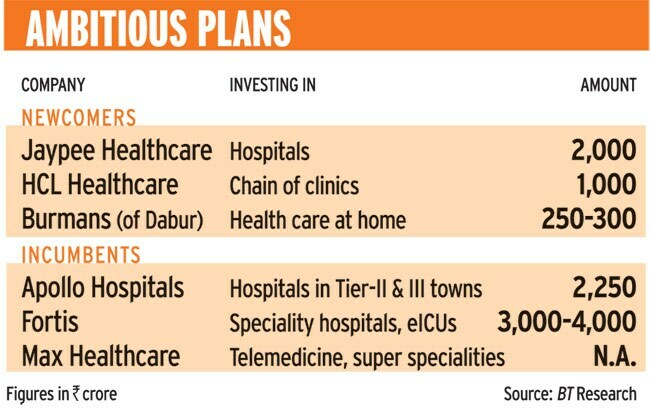 The oldest player in the business, Apollo Hospitals too is investing Rs 1,500 crore to expand into Tier-II and III towns. 'Profitability was under pressure because of expansion and acquisitions, but now we have built scale and profitability will be back,' says Aditya Vij, CEO, Fortis Healthcare. The current expansion, however, differs significantly from a similar burst of activity around 10 years back in that it is better planned and targeted. "Hospitals as a business venture should stand on their own feet and be profitable," says Jaypee's Gaur. The heavy investment in technology, for instance, is expected to provide returns for years to come. "The cost of the technology we are installing today can be divided over the 100 clinics we will set up in coming years," says HCL Healthcare's Malhotra. Profit is paramount for the Burmans as well. "The family is putting its wealth into areas which are growing fast and offer opportunity," says Srivastava, explaining the decision to enter the sector. In the earlier phase, today's established players incurred sizeable debts. Fortis, for instance, acquired the Escorts hospitals and the Wockhardt chain of hospitals, expanding its network to 66 units and making it the largest chain in the country. Fortis's Vij notes that the company has practically cleared its debts by selling off its entire international business, barring a single hospital in Singapore. "Our debt equity ratio is down to 0.2 from 1.7," he says. "Profitability was under pressure because of expansion and acquisition, but now we have built scale and profitability will be back." Apollo has 51 hospitals and Max 10. In 2013/13, private equity money in health care has gone up 54 per cent to $2 billion a year. More players open up more avenues. In the last 10 years 80 per cent of new bed capacity was built by private players. Still, an additional 650,000 beds are required to cater to the demand, which will require a capital investment of Rs 1,62,500 crore by 2017, according to a McKinsey report. Clearly, no one will eat into another's business. The scope for private health care is immense. New players will only help in building better infrastructure.